15” x 15” limited edition art on metal reproduction. A combined effort of Alaskan artist Jon VanZyle and Alaskan photographer Jeff Schultz. TOGETHER AGAIN !! After the success of last year’s “Reaching the Goal” combined artwork, Official Iditarod Artist Jon Van Zyle and Official Iditarod Photographer Jeff Schultz once again blend their respective talents into one special image. 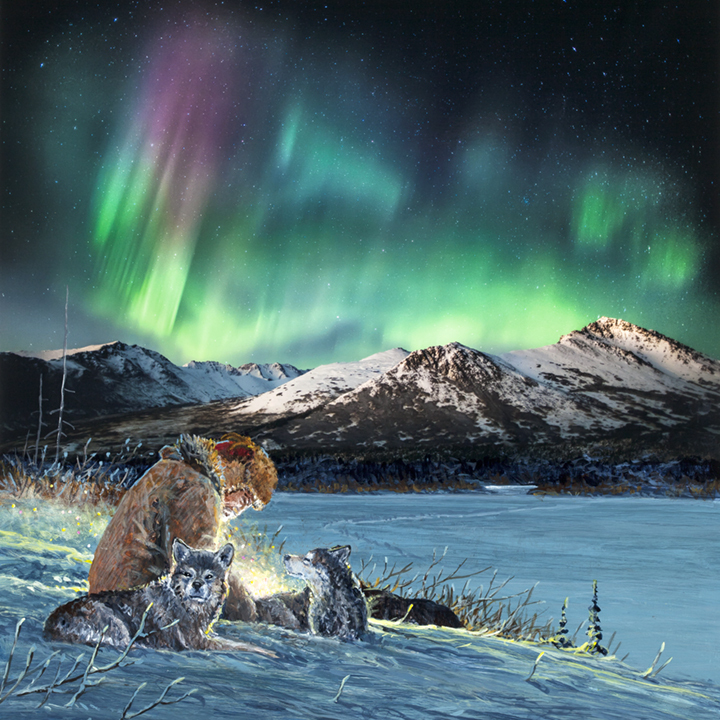 Jon has added his talents of painting a musher tending to his sled dogs at lakeside to one of Jeff’s photographs of the Aurora Borealis (Northern Lights) over Alaska’s Chugach Mountains to create another one-of-a-kind piece of art. In a limited edition of 125, hand-signed and numbered by both artists, the 15” x 15” artwork is printed on metal with a high-gloss surface and is ready to hang. Allow up to 3 weeks for production and packing, plus shipping time. Local Pickup– $10.00 packaging fee for those who prefer to pick up their art print in person in Anchorage. Once you place your order and your order is ready for pickup, we will email you the location information for pick up in South Anchorage. International Orders: Sorry, but due to the risk of potential damage, insurance and costly postage fees, we cannot ship the artwork to international destinations, including Canada. If you’d like to order, please contact a friend who lives in the States and have the artwork shipped to them and then they can ship it on to you. So sorry, but our experience in this has been painful and time consuming. Printed locally in Alaska to metal by our friends at Ravenink.